This National Agriculture Day, March 20, we honor those who work tirelessly to put the nation’s most popular U.S.-grown fruit into the hands of our families and friends. Here’s to the U.S. apple growers who produce 260 million bushels of apples each year. Here’s to the workers who wake up before the sun and skillfully pick our apples at peak freshness. Here’s to the families who support these growers and pickers when times get tough. Each year, our growers hope that winter ends on time and fall lasts a few weeks longer. They hope for enough rain, but not too much. They hope for plenty of sun, but not too much. They hope for cool nights to allow their apples to take on those amazing colors. Growing apples is not for the faint of heart. But those are not the only unknowns with which they must contend. It’s no secret that the political climate is tense. Each day we face the concern that NAFTA could be terminated or damaged, disrupting relations with Mexico and Canada, where we export $450 million worth of our $4 billion crop. We endure ongoing pressure of finding enough workers to sustain our businesses. In the midst of these frustrations, we want to take a step back and shine a light on the people who keep the industry alive and thriving. Apple growing truly is a labor of love — requiring incredible attention to detail throughout the entire process. The growers watch over their trees, meticulously analyzing their health, pruning them during winter, thinning blossoms during spring to increase fruits’ size and color, and mowing grass to fight pests during summer. Then there’s the full-tilt fall rush to get the apples harvested at the peak of their flavor and crunch. The people who pick our apples are performing a delicate art. To prevent bruising, the apples must be picked by hand and carefully placed in cloth buckets worn over the pickers’ shoulders. To say this is labor intensive is an understatement; these bags can weigh up to 50 pounds per load. We rely heavily on a migrant workforce during this time. They show up, rain or shine, every day. Without their dedication, tons of apples, literally, would be wasted each year. Simply put, there would not be enough labor to cover the 323,000 acres of orchard land. Once picked, the apples are packed and stored in refrigerated warehouses until they are sold. Here’s to the packers who carefully store apples post-harvest, ensuring you can enjoy crunchy, fresh U.S. apples no matter the time of year — at your grocery store, school cafeteria, convenience store and local restaurant. On National Agriculture Day, we celebrate the 7,500 growers who have maintained their multi-generation family farms and the thousands who support them. Today, when you bite into a juicy, crisp apple, remember where it comes from. Please join us in appreciating the passion and hard work these farmers put into every step of growing and producing our healthy, delicious and all-American food. 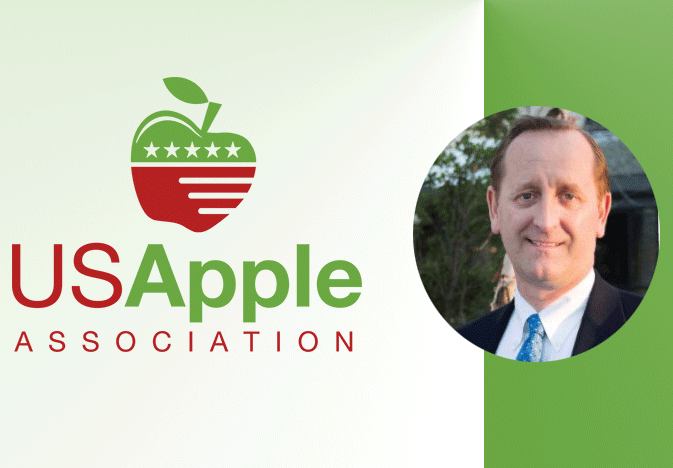 Jim Bair is the president and CEO of the U.S. Apple Association.